Tonight, moving eastward as it always does in orbit around Earth, the moon will pass by the famous Pleiades star cluster. 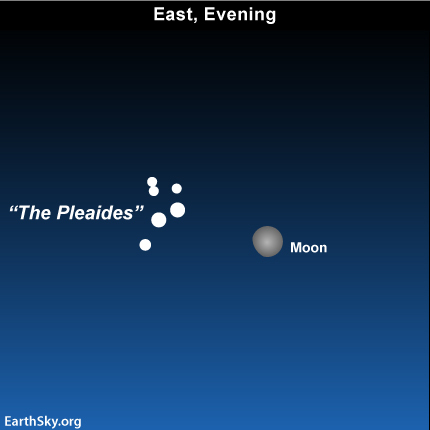 Our sky chart shows you what the moon and the Pleiades cluster might look like through binoculars this early evening. Notice that the Pleiades has a dipper shape. Early stargazers sometimes described the Pleiades as a ’swarm of bees’ in the night sky. Modern stargazers sometimes mistake it for the asterism known as the Little Dipper. The true Little Dipper is always in the north, while the tinier dipper of the Pleiades travels from east to west across the sky. The Pleiades star cluster is also called the Seven Sisters. It is one of the most noticeable sights in the sky, easily recognizable when the moon moves out of the way. Try looking at the Pleiades in a moonless sky in a week or two. To the average human eye under good conditions, six or seven stars of this cluster are visible. That is the reason for the common name Seven Sisters. But a small telescope or a good pair of binoculars reveals several dozen stars here, and in fact there are several hundred members of this cluster known to the great telescopes of professional astronomers. The Pleiades marks the shoulder of the Bull in the constellation Taurus. This compact grouping of stars seen on our sky’s dome is an actual star cluster. The stars of the Pleiades were born from a single cloud of gas and dust, and they still move together through space. The Pleiades stars are relatively young, as stars go, and quite hot, as evidenced by their bluish color. You also will note a fuzziness around and between these stars, which is due to reflection off particles in a cloud of dust through which the cluster is passing. You might find it interesting that there is evidence (in the composition of the sun), that our life-giving star started out in a cluster, perhaps similar to the Pleiades. If so, over time, our sun’s brother stars would have dispersed through our region of the galaxy.